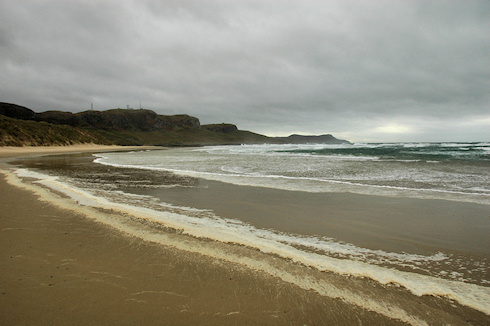 That's of course Machir Bay and Kilchoman Beach on the west coast of Islay, taken on a stormy day in October 2008, just over a year ago. Dark clouds rushing past, spray in the air, waves breaking over the rocks at the southern end of the bay. Quite a bit of ‘foam’ washed up and blowing over the beach (I think it's from some algae?). As usual I'll post the larger version (larger as in more than twice as big) on the Islay Pictures photoblog on Saturday morning. Until then I'm going to pour another dram of Laphroaig. Good night for now, don't forget to batten down the hatches if you're on Islay!